The credit crunch that's enveloped global financial markets has many consumer and business owners worried about the availability of consumer-friendly financing options. The crunch has caused many lenders to cut back in different ways, but 0% credit card offers are still numerous and often generous. Some consumers have complained of out-of-the-blue credit line decreases, but, from my own anecdotal observations, these situations appear to be few and far between. Keep your credit score high and your balances low and you shouldn't have to worry about sudden and inconvenient limitations on your credit. I'm still getting lots of great, unsolicited 0% offers in the mail, from accounts I already have open as well as offers to open new accounts. When these offers start drying up, I'll start to worry. The Federal Reserve has been cutting short-term rates since mid-September of last year in an effort to ward of recession and help cure problems in the financial markets. 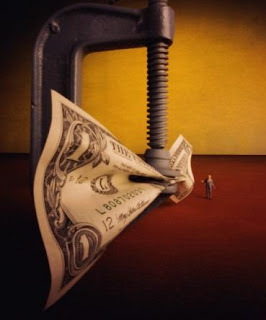 Some Fed rate cuts have been very aggressive, and the central bank will likely cut rates again on March 18. These interest-rate decreases will get consumers and businesses into borrow-and-spend mode, and will also grease the wheels of the banking system and make it easier for Americans to find consumer-friendly loans and credit products. When the Fed cuts short-term rates, the U.S. Prime Rate is one of the key rates that's lowered by extension. Since most variable-rate credit cards are indexed to Prime, this means for most people, the interest rate on their credit card debt is now -- or will be soon -- 2.25 percentage points lower than it was last summer. With the Fed likely to cut again in March, consumers who carry balances from month to month will end up keeping more of their hard-earned money, which is always a good thing. Some credit card companies don't want to lower their rates when the Fed lowers the U.S. Prime Rate. Since these companies can't control the Prime Rate, whenever the Federal Reserve cuts the U.S. Prime Rate, these banks will counter by raising the margin that they add to Prime (if you have a variable-rate credit card then, most likely, your APR = U.S. Prime Rate + A Margin.) It's perfectly legal for them to do this (gotta' read those terms and conditions carefully) but, understandably, most consumers find this tactic underhanded. If the Fed is in a rate-cutting cycle, and you find that the APR on your credit card isn't declining steadily in sync with Fed actions, then call your credit card company and ask for an explanation. If you don't like what they have to say about it, then you may want to consider transferring your credit card balance to new a credit card at a new bank. Bottom line: if you've experienced some manifestation of the credit crunch, don't worry: the pain is almost over.